We are the prominent manufacturer, supplier and exporter of Process Equipments which includes Chemical Process Equipment and Industrial Process Equipment such as Water Treatment Plants, Pressure Vessels, Jacketed Vessel, Industrial Chimneys, Anti Correo Industrial-piping-fittings Lining, Sand Blasting System, Piping etc. Wastewater comprises a mixture of domestic sewage (waste from household toilets, sinks, showers and washing machines), industrial effluent, occasional run-off of surface water and ground water which has infiltrated into the sewers. Wastewater is 99.99% water, with a small amount of dissolved or suspended solid matter. At our treatment plants the wastewater undergoes a multi-stage treatment process to clean it before discharge or reuse. 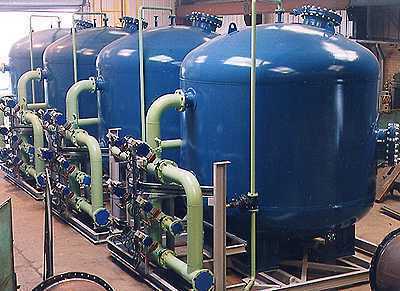 Clarifiers are used for the purpose of clarification of wastewater. Clarification is the widely accepted and the oldest used method in the effective treatment of water and wastewater. This operation includes removal of sediment, floating material and turbidity from raw wastewater. Pressure Vessels contain liquids or gases at pressure levels greater than that of atmospheric pressure. 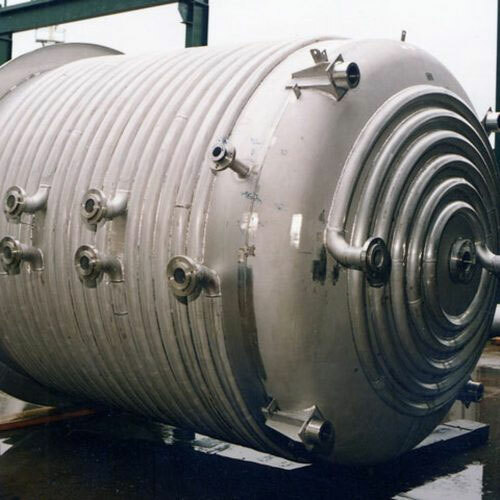 The Pressure vessels are designed as per ASME Boiler & Pressure Vessel Code to operate at pressures more than 15-20 PSI and are usually cylindrical in shape and have a horizontal or vertical orientation. Pressure Vessels are designed with Dishends only and based on factors such as Operating Pressure and Temperature, Liquid stored, Atmospheric conditions, Safety factors like Hydrotests, Radiography etc. Reactor Vessels are highly suitable for the petro-chemical, resins, polymers, coatings, adhesives, chemicals, plastics industries. 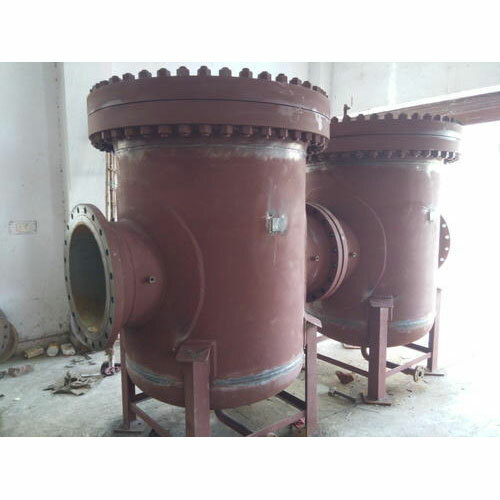 These reactor vessels are equipped with propeller, paddle, helical or anchor type agitators alongwith a motor mounted on top of tank for mixing the materials inside the tank. Reactor Vessels are designed based upon the process conditions, product characteristics, Viscosity, degree of agitation required for achieving the desired end product to be used. Jacketed vessels are designed to control the temperature of its contents inside the tank making them hot or cold as per the requirement of customer. These Jacketed vessels are provided with an External/Internal jacket around the tank's body through which a cooling or heating fluid is circulated to maintain the desired temperature. 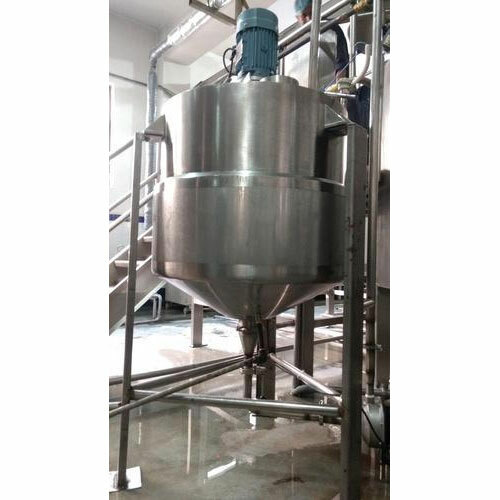 These Jacketed vessel can also be equipped with propeller, paddle, helical or anchor type agitators to facilitate the mixing of highly viscous fluids. Air receivers are used to provide compressed air when short-term demand exceeds the compressor output. Air Receivers are effective in reducing the pulsation and repetitive cycling of the compressor operation providing a uniform output of compressed air to the system. Air Receivers also eliminate moisture, oil, dirt from the air thus leading to less wear & tear and corrosion of the equipment. They are fitted with Pressure gauge , Safety valve, Drain valve, NRV etc. as standard accessories for safety purposes in case of emergency. These machines are used in all the Button manufacturing units where Polyster buttons are manufactured by Resin and then Polished in this machine. An Octagonal shaped Barrel is used wherein the buttons along with other polishing agents are fed inside the barrel and rotated at high speeds for a specific time with the help of a motor. The buttons being in contact with the polishing agents get a perfect finish which are then unloaded from the barrel by a motor and then sorted to separate out the buttons. The Barrel is Rubber-lined from inside as the polishing agents are abrasive and corrosive in nature, thus protecting the barrel from corrosion and ensuring long life of the product. 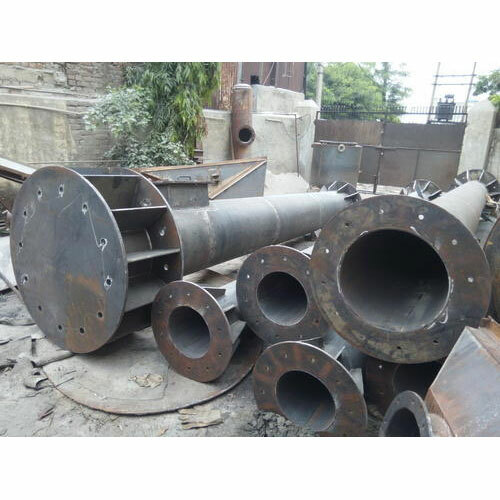 Industrial Chimneys are used for applications in oil industries, steel mills, chemicals factories, boilers where the bi-products of the process include gases which need to be released in the air at a height of 30 metres or more as per industrial pollution norms. 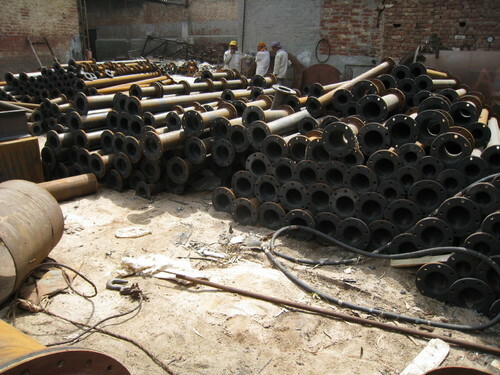 These Industrial Chimneys are fabricated from carbon steel or mild steel depending on design conditions and cost considerations and are available in a variety of lengths, diameters, and material thickness with various types of linings/coatings to protect it from the corrosive action of gases at high temperatures. Various types of Anti Corrosive Lining are used to protect the vessels, tanks, water treatment plants, pipes, flanges and any other equipment which is used in any corrosive environment or storage of corrosive liquids. Every fluid/liquid has a different corrosive nature some being highly corrosive in nature and some not very corrosive, and they react differently with different metals. So for different applications we have different types of linings in varying thickness to protect the equipment in the best possible way from corrosion. Wear resistant linings for coal handling plant, coatings for conveyor rollers etc. 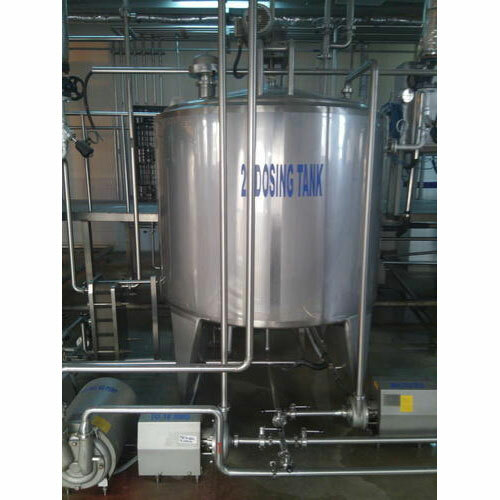 Stainless Steel Milk Storage Tanks are used for storing Liquid Milk and Powdered Milk in Stainless Steel Tanks. 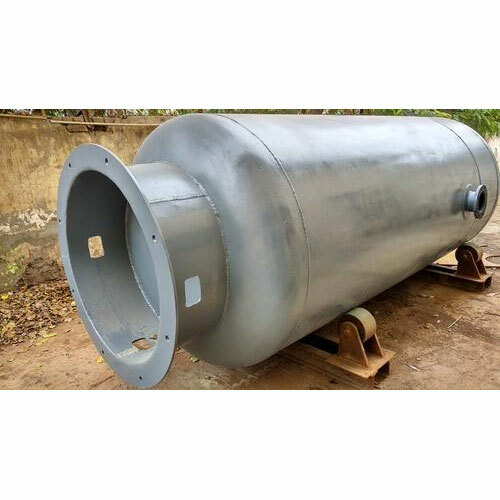 These Stainless Steel Storage Tanks are either vertical or horizontal in orientation and are made in S.S 304/316 only as Milk comes under Food & Beverages Industry wherein it is mandatory to use Stainless Steel only for storage of all kind of Food & Beverages. These tanks are glossy/mirror polished from inside for smooth flow of food material from the tank. 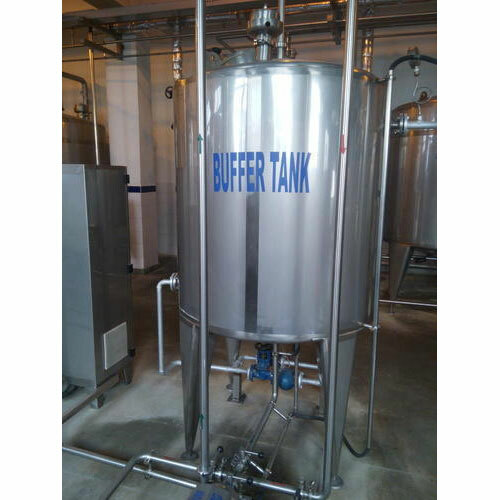 Stainless Steel Process Vessel are pressure vessels used to store various types of Medicines & Drugs in liquid and powder form used in the Pharmaceutical Industry. As per the quality & safety norms all types of vessels and storage tanks used in the Pharma Manufacturing Plant should be made of Stainless Steel 316 only. 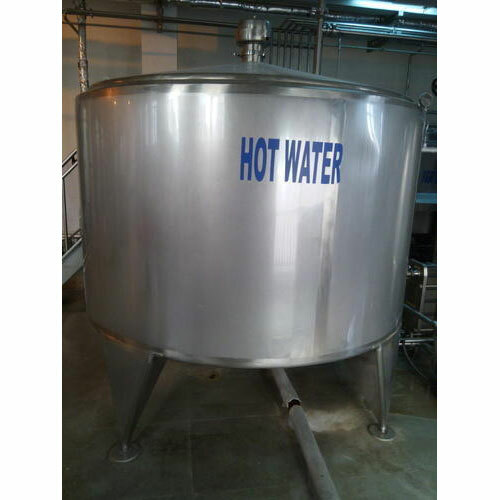 Process Vessels are often temperature and pressure controlled and provided with an outer jacket for running Steam or Water to maintain the desired temperature in the vessel, have dishend pressure heads with heavy flanges and are glossy/mirror polished from inside. 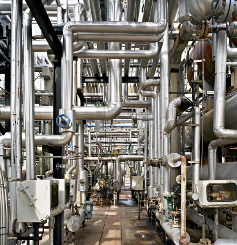 These process vessels can be mounted on a pipe frame with wheels for easy mobility in the plants. 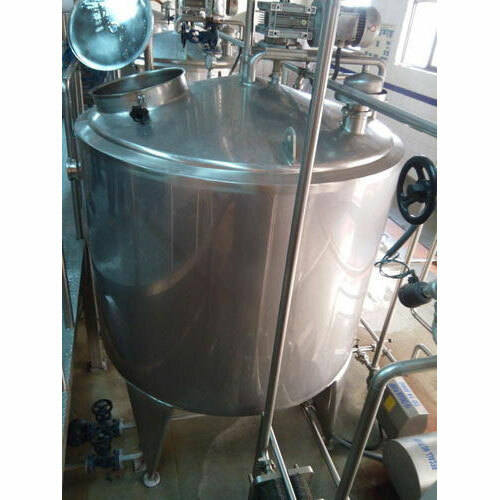 Stainless Steel Alcohol / Beverage Storage Tanks are used for storing various types of Beverages such as Cold Drinks, Hot Drinks, Soda, Energy Drinks, Milk Shakes, Tea, Coffee. Alcohol Storage Tanks are used for storing various types of Alcoholic Spirits like Beer, Whiskey, Wine, Vodka, Rum, Gin, Tequila. These tanks are made of Stainless Steel only as they are categorized under Food & Beverages Industry making it mandatory to use S.S 304/316 for storage of any food-item. 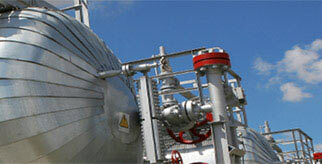 These tanks are provided with an outer jacket for maintaining desired temperature of the fluids inside the tank. Water Storage Tanks are used for storing drinking water as well as grey water which is untreated contaminated water with impurities. Water Storage Tanks are made of Stainless Steel 304 only as it provides corrosion and contamination free service for years. Food & Beverages, Pharmaceutical Industries use stainless steel only in their manufacturing plant due to Quality and Safety guidelines by the government. 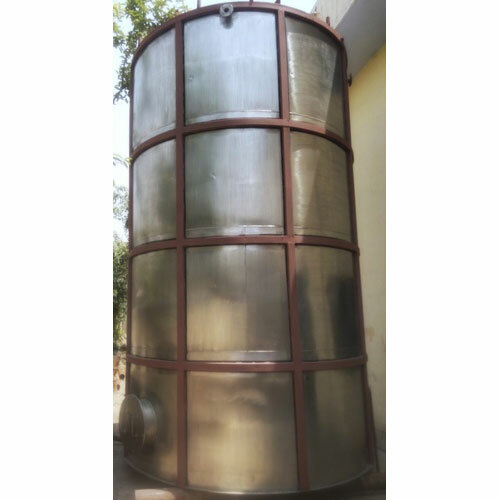 Nowadays people are shifting from plastic and preferring Stainless Steel because of hygiene, quality and life of storage tank.